Even with the flu, I could eat 10 of these. I know brownies aren’t cake, but come on. 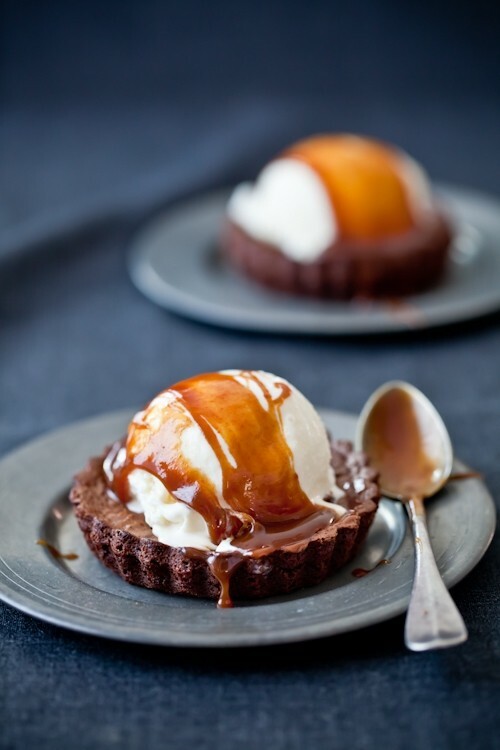 Brownies+ice cream+caramel=foodgasm. Notes: you can replace the gluten free flours with 3/4 cup all purpose flour if not gluten sensitive. Preheat oven to 350°F and position a rack in the center. Line an 8-inch square baking dish with parchment paper, leaving a 2-inch overhang on 2 sides. Butter the paper and set aside. In a heatproof bowl set over a pan of simmering water, melt together the butter, chocolate, and cocoa. Remove from the heat and stir until smooth; let cool slightly. In a medium bowl, whisk together the rice flour, cornstarch, millet, baking powder, and salt. Set aside. In the bowl of an electric mixer fitted with the whisk attachment, whip the eggs, sugar, and vanilla until pale on medium high speed, about 4 minutes. Beat in chocolate mixture. Add kahlua or coffee. Add flour mixture and beat until just combined, scraping down sides of bowl as needed. Pour the batter into your prepared pan and bake 30 to 35 minutes until a knife inserted near the center comes out clean. Let cool 15 minutes, lift out of pan, and transfer to a wire rack. Let cool completely. (check at 15-20 minutes if using smaller molds). Cut into 8 rectangles. Brownies can be stored in an airtight container at room temperature up to 3 days. In a large saucepan, stir together the cream, milk, sugar and ginger. Bring the mixture to a simmer over medium low heat, stirring occasionally to dissolve the sugar. Remove from the heat and let steep as it cools to room temperature. Refrigerate, preferably overnight. Strain if desired. Process the mixture into your ice cream maker according to the manufacturer’s intructions. In a heavy saucepan set over low heat, combine the sugar and water. Cook just until the sugar is dissolved. Add the butter. Let it come to a boil and cook until it reaches a golden caramel color. Remove from the heat and add the cream ( it will splatter and get crazy). Whisk to combine and put back on the stove. Let it come to a boil again over low heat and cook 25-35 minutes until you reach a creamy consistency. Pour into a jar and try to refrain yourself from drinking it!